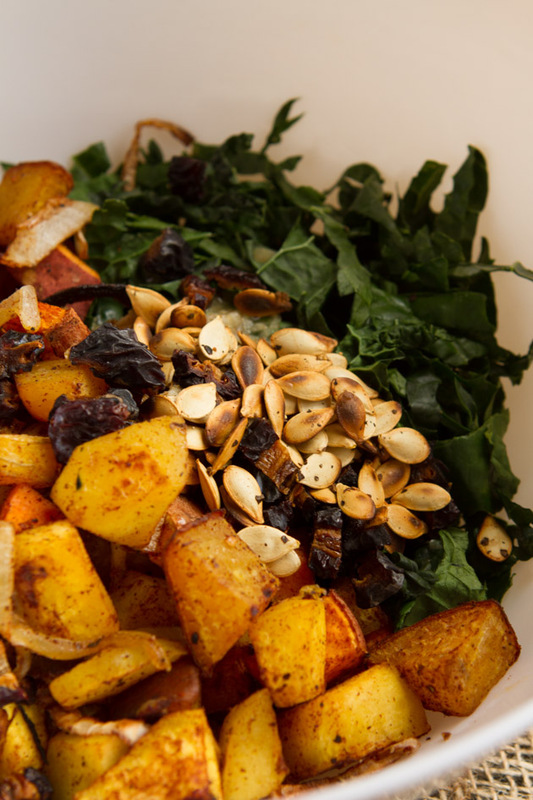 Cinnamon roasted root veggies, combined with soft greens, toasted squash seeds and a garlic dressing. Serve this salad warm, fresh out of the oven. Kevin, Lexy, Pebbles, my Dad and I are nestled in the fifth wheel kickin’ it camping-style this long weekend. We slept in on Saturday, snacked on grain-free apple cornbread (yum! ), played cards for most of the afternoon, and for dinner? I made us this salad. It’s a recipe that I have been enjoying for a couple of weeks. (It was the star of my Instagram lunches and dinners last week). It’s warm, hearty, and just plain, good. This paleo and vegan salad recipe is stupidly high in vitamin A, C (good for your immune system) and B6 (the B vitamin for the ladies!). Beets, squash, sweet potato, kale, squash seeds, if it doesn’t scream Fall, I’m not sure what does. Okay, back to the fire. It’s too early in the morning to make s’mores, right? 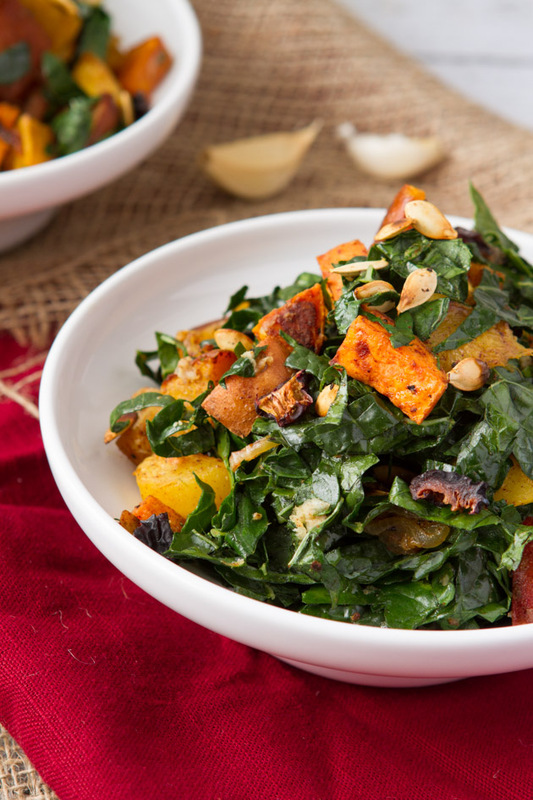 Cinnamon roasted root veggies, combined with soft greens, toasted squash seeds and a garlic dressing. Serve this salad warm, fresh out of the oven. Preheat your oven to 400F and set aside a baking sheet. No need to cover it with parchment or silicon baking mat. Drop sliced onion, beets, sweet potato, squash, oil, cinnamon, salt and pepper on baking sheet. Toss with hands until everything is coated. Give a good shake of salt and pepper and place in the oven. Roast for 30-35 minutes, rotating halfway through. 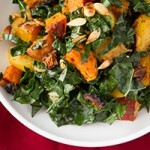 When the veggies are about 2 minutes away from completion, remove from the oven, place the chopped kale on top. Return back to the oven. Meanwhile, combine dressing ingredients in a small bowl. Set aside. Remove the squash guts form the seeds. Place them in a frying pan with a dash of salt and pepper. Heat on medium-low heat. Roast until golden, stirring often. 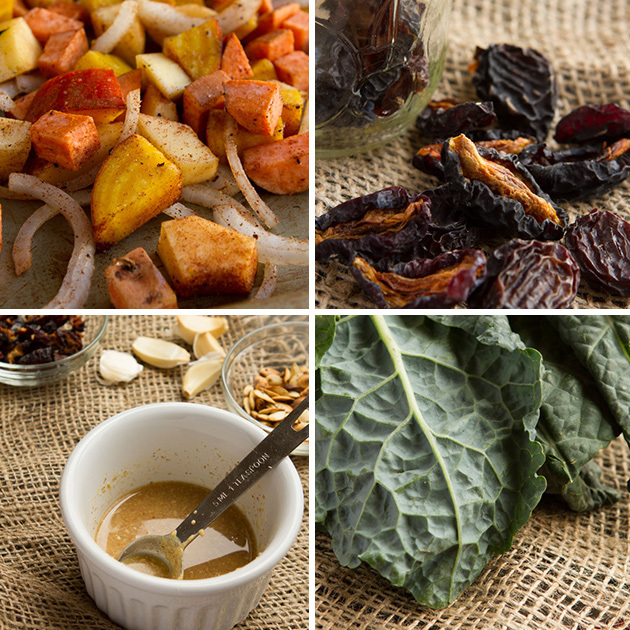 When veggies are done, transfer to a bowl, add dressing, prunes and toasted squash seeds. Serve it up! Squash - any type of squash could be used here. The cubes yielded about 2 cups. Prunes - any type of dried fruit could be used here. Cranberry, raisins, dates, whatever. Preheat your oven to 400F and set aside a baking sheet. There is no need to cover the baking sheet with parchment or silicon baking mat. Drop sliced onion, beets, sweet potato, squash, oil, cinnamon, salt and pepper on baking sheet. Toss with hands until everything is coated. Give a good shake of salt and pepper and place in the oven. Roast for 30-35 minutes, rotating halfway through. 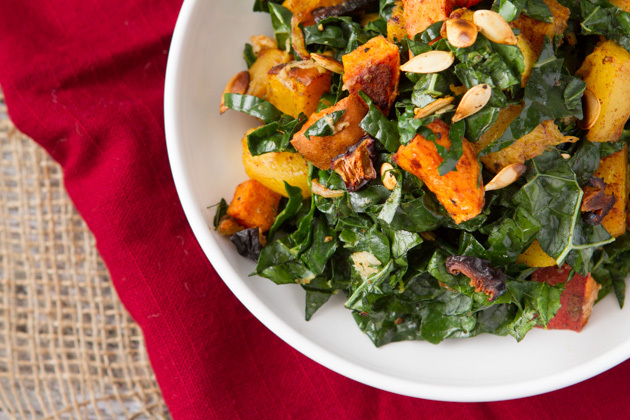 When the veggies are about 2 minutes away from completion, remove from the oven, place the chopped kale on top. Return back to the oven. Baking the kale like this, slightly, makes it easier for your body to digest. Meanwhile, combine dressing ingredients in a small bowl. Set aside. Remove the squash guts form the seeds. Place them in a frying pan with a dash of salt and pepper. Heat on medium-low heat. Roast until golden, stirring often. When veggies are done, transfer to a bowl, add dressing, prunes and toasted squash seeds. Serve it up! In preparation for my new blog design (coming later this year) I’ve switched up the layout of my recipe blog posts. Let me know how you like the new layout, or if anything juts out at you as needing to be fixed, altered or cut out! Happy Thanksgiving to all of my Canadian pals and Columbus Day for my friends south of the border ;) PS: AOR and I just launched our first giveaway. Check out the Healthful Pursuit Facebook Page and Instagram to enter!